Objective To describe the population of women in southwestern Ontario who were diagnosed with potentially preventable BRCA mutation–related breast cancer. Setting The Cancer Genetics Clinic of the London Regional Cancer Program in London, Ont. Participants Patients younger than 52 years of age who were referred to the London Regional Cancer Program Cancer Genetics Clinic between 1997 and 2007 for BRCA testing after being diagnosed with breast cancer (N = 1017). Main outcome measures The proportion of women with BRCA1 or BRCA2 gene mutations and the proportion of women who would have qualified, based on family cancer history, for referral for genetic counseling and testing before their breast cancer diagnoses. Results Among the 1017 women referred for BRCA testing, 63 women younger than 52 years of age who had been diagnosed with breast cancer were found, subsequent to this diagnosis, to have BRCA1 or BRCA2 gene mutations. Of these, 41 (65%) had family cancer histories that would have qualified them for genetic counseling and testing, according to provincial criteria, before their own breast cancer diagnoses. Of the 63 women, most (81%) had been referred for BRCA gene mutation testing by their oncologists or surgeons. Conclusion Our results suggest that the diagnosis of breast cancer could have been anticipated, and perhaps in some cases prevented, in up to two-thirds of high-risk women younger than 52 years of age in southwestern Ontario. If the high-risk status of these women had been recognized, they might have had the opportunity to choose genetic counseling, testing, more effective cancer surveillance, and potentially preventive options. The results of this study call for increased public and care provider awareness about hereditary breast cancer risk to promote women’s ability to choose to access genetic counseling. The purpose of this study was to identify and describe the population of women in southwestern Ontario who were diagnosed with potentially preventable BRCA mutation–related breast cancer. By recognizing women who were at identifiably high risk before breast cancer diagnosis, but who might not have been offered access to genetic counseling, testing, surveillance, or preventive strategies, we can explore the obstacles to this identification and work to ameliorate this issue. The study protocol received full ethics approval from the University of Western Ontario Health Science Research Ethics Board for the London Regional Cancer Program (LRCP). The London Health Sciences Centre Molecular Diagnostic Laboratory is 1 of 7 provincially recognized molecular laboratories that provides BRCA genetic testing in Ontario. It is located in a region with a few small cities (London, Windsor, and Sarnia) and a large rural population. subsequently identified as a BRCA1 or BRCA2 mutation carrier. Figure 1 illustrates the chart review process. The age of 52 has been identified as the average age of menopause,29 and BRCA gene mutation–related breast cancer is more likely to occur before menopause.11,30,31 Testing for BRCA mutation has been publicly funded in Ontario since 2000,32 but has been available in Ontario since 1995 through research studies.33,34 The year 1997 was chosen as a cutoff as it represents the year in which BRCA testing was widely available through the Cancer Genetics Clinic at the LRCP. Comprehensive patient demographic characteristics, as well as medical and family histories, were obtained by genetic counselors during initial consultations with patients at the LRCP; this information, including information on the source of referral to the genetics clinic, was extracted from each of the 122 charts (by M.V. and W.C.) using a data collection tool developed for this process. Family histories were used to categorize patients into groups within the Ontario Ministry of Health’s (MOH’s) classification system.28 The abstractors independently categorized patients into MOH groups. When a patient qualified for more than one MOH group, she was placed in the group with the highest positivity rate. Lists were compared for discrepancies, and consensus was achieved on the categorization of each patient. We evaluated whether each woman would have been eligible for testing before her own breast cancer diagnosis by using the Ontario MOH testing criteria,28 as these criteria are still used by the LRCP Cancer Genetics Clinic and are congruent with currently available resources.28,37 Using the MOH criteria,28 the family histories of 63 patients were examined to determine if these patients met the criteria for BRCA testing before their own breast cancer diagnoses. Table 128,35 outlines the standards for genetic testing, as developed by the Ontario MOH28 and used at the LRCP Cancer Genetics Clinic. Within this classification system, patients were grouped according to their family histories obtained by genetic counselors during the initial consultation. Sixty-five percent of the patients in the study population presented with family histories that would have qualified them for genetic testing before their own breast cancer diagnoses. As illustrated in Table 1,28,35 the family histories of 41 patients would have been sufficient to warrant genetic testing before personal cancer diagnosis. Ontario MOH policy instructs that, when possible, the highest-risk affected individual in a family should be tested first, to maximize detection rates.28 This is known as the principle of best to test. However, any woman who meets MOH risk criteria28 can access genetic counseling when the best-to-test family member is not available or does not wish to be tested. Figure 2 illustrates the source of referrals for genetic testing. As expected when examining a population of women who had already been diagnosed with cancer, by far most referrals for genetic counseling and genetic testing (81%) were made by local oncologists or surgeons. OFBCR—Ontario Familial Breast Cancer Registry. Sixty-three patients of the LRCP diagnosed with breast cancer between 1997 and 2007, before the age of 52, might not have been offered genetic counseling or BRCA genetic testing before their cancer diagnoses. Forty-one of the 63 patients (65%) presented with family histories that would have qualified them for genetic testing before their own breast cancer diagnoses. Therefore, two-thirds of these patients could have been identified as being at increased risk of developing breast or ovarian cancer and, if so identified, would have had the opportunity to access genetic counseling and possibly testing, surveillance, and preventive strategies before they developed breast cancer. Women might have low levels of knowledge about hereditary breast cancer, even if they are from high-risk families.38 Common misconceptions include the belief that paternal family history does not confer substantial risk39,40 or thinking that sharing physical attributes with a family member makes it more likely that other genetic attributes are also shared.41,42 Without public education, women must rely on their health care practitioners to recognize their risk and provide appropriate referral for genetic counseling or testing. Canadian women have enthusiastically voiced their support for public education,43,44 fearing that their primary care providers might not have the necessary time or knowledge to educate them about these topics. Canadian primary care providers have also expressed interest in increased educational and information tools for women, and for themselves.45 In addition to the need for increased genetic education for primary care providers and the public, our data might also reflect the well-understood problem of many patients not having access to primary care providers46,47 and having to rely on walk-in clinics, where the focus might be on acute issues and where full family histories are not always elicited. As genetic testing becomes increasingly prevalent, the direct involvement of primary care providers will be necessary to ensure access for as many Canadians as possible.48 However, high-risk women might not be receiving referrals for genetic services because they might not have primary care providers46,47 or their primary care providers might have incomplete knowledge of, might have forgotten, or might only have access to out-of-date family histories.49–51 Primary care providers might struggle with time constraints that impede their ability to assemble family cancer histories, or they might not have adequate knowledge of new genetic information and services.48,52–56 Primary care providers might not know where to refer patients for genetic counseling, even if they are aware of the existence of such services.57 Considerable constraints on the provision of predictive genetic services in primary care make it unreasonable for women to be solely dependent on their primary care providers for recognition of the need for and provision of genetic testing services.58 As Miller and colleagues56 point out, these barriers to genetic services in primary care might constrain all but the most resourceful or persistent patients. Family histories provided to primary care providers are not always as detailed as those provided to genetic counselors after breast cancer has been diagnosed. There is evidence that patients do not always share available family history information with their physicians,60 perhaps because they do not understand the importance of the information. A systematic review found that patients with personal diagnoses of cancer were more likely to provide accurate family history information than control patients were.61 This recall bias is a challenge to primary care providers trying to gather comprehensive family histories. Improved access for primary care providers to genetic counselors might alleviate the difficulty in finding clinical policy and practice guidelines in this area.65 Although attempts have been made to provide primary care providers with the information they require to determine which patients are at high risk of hereditary breast cancer and to offer referral to genetic counseling,49,68 primary care providers report that they wish to receive more information about this topic.57 The Ontario MOH testing criteria used in this study28 are no longer readily available online to either health professionals or the public, as the original task force, assembled to generate guidelines, principles, and broad criteria for referrals for genetic testing28,32 has been dissolved. Ontario physicians can access information about managing women at risk of hereditary breast cancer by using bulletins from the Ontario Health Insurance Plan (OHIP),37 the Canadian Cancer Society risk triage and management recommendations,69 or an article from the original task force28 published in the Ontario Medical Review. However, to use these resources, physicians must be able to recognize the risk factors for hereditary breast cancer. In some cases, a substantial search must be made to access these clinical resources. For example, the OHIP bulletins are not available from the main OHIP bulletin site, and the original task force article published in the Ontario Medical Review is not currently available online. There might be guidelines more readily available to physicians in other provinces through their own provincial medical associations. Patients and physicians alike would greatly benefit from updated, comprehensive, easy-to-use evidence-based guidelines disseminated publicly, and physicians have indicated interest in more provider and patient education.57 There has been a recent move toward educating primary care providers about genetics issues (eg, the GenetiKit research project49,68), and increased education should increase early access to genetic counseling services. The issues of physician time and education are secondary to a more important ethical issue, that women should not have to rely on their primary care providers (if indeed they have primary care providers), given the current constraints on practice. It is important that women have access to publicly available information so that they can identify their own risk and choose to bring this to the attention of their primary care providers. Public information about the type of family histories that can indicate risk would enable many women to assess their personal risk and begin conversations with their primary care providers. Primary care providers should consider that not all women with family histories of breast or ovarian cancer will wish to know their genetic status.76 A systematic review of studies examining women with high-risk family histories found a mean of 63% chose to be tested for BRCA gene mutations, although a range of uptake rates has been reported in the literature (24% to 93%).77 Among women who choose to get tested, positivity rates for BRCA gene mutations will vary considerably, depending on background and family history.78 If a woman belongs to a family which has an autosomal dominant inheritance pattern but in which no woman with breast cancer has tested positive for a BRCA gene mutation, she might still be at increased risk of breast cancer, even after testing negative for a BRCA gene mutation herself.12,13,79,80 There are several non-BRCA gene mutations that have been identified,13 and considering that BRCA gene mutations account for only an estimated 25% of hereditary breast cancers,14 there will surely be more gene mutations identified in the future. Genetic counseling can still be beneficial to a woman without a mutation diagnosis because it can help her understand her individual level of risk and inform her of available surveillance strategies such as MRI or more frequent breast examinations. 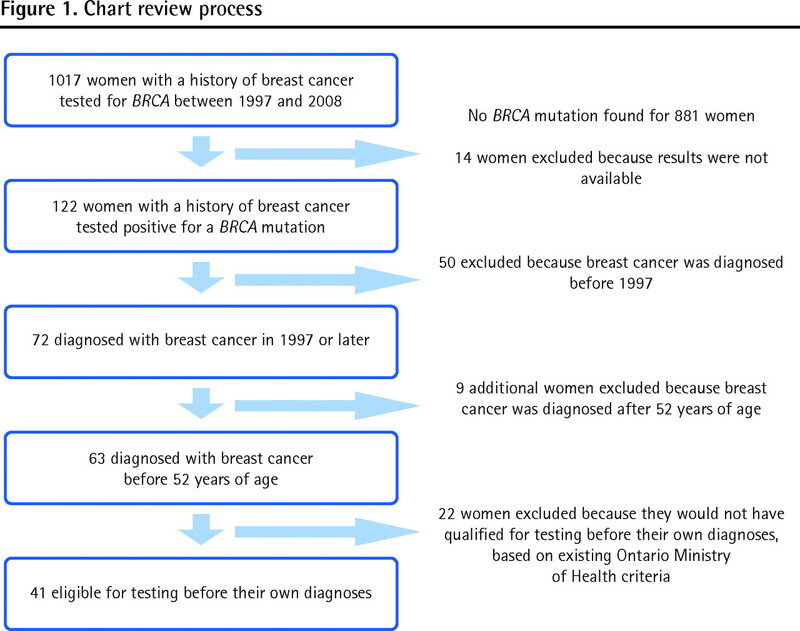 Not all women who test positive for BRCA gene mutations will wish to pursue preventative pharmaceutical or surgical treatment; uptake rates for preventative strategies vary by country, age, access to care, cost, and psychosocial factors81 and are strongly influenced by a woman’s emotional response to previous cancer experiences and other psychosocial factors.82–84 Women who do not wish to pursue pharmaceutical or surgical risk reduction procedures might still wish to increase their surveillance through a combination of more regular breast examinations (either self-examination or examination by primary care providers), MRI, or mammograms. This study represents the experiences of women referred for genetic counseling and BRCA genetic testing subsequent to their diagnosis of premenopausal breast cancer in southwestern Ontario, and it reflects the geographic nature of our study population (smaller cities, rural areas). This study protocol needs to be applied in other regions to relate these findings to particular regional populations. The starting date of 1997 was chosen to reflect the policies and procedures in place for testing in southwestern Ontario at the LRCP. Data collection beginning in 1997 is a clear limitation to the generalizability of the study in relation to other centres, as the policies and funding mechanisms in other regions of Ontario might not have been put in place until 2000. In other regions, access to BRCA gene mutation testing might have been confined to research studies that might have excluded some of the patients in our study. This time frame was chosen to illustrate the scope of the issue, not to imply that family physicians in this area should have been referring the patients in this study during this time. As our study reviewed charts from a genetics clinic, it was not possible to determine how many women were offered referrals to genetic counseling and declined. While we know the source of referral to the genetics clinic, it was not possible to determine how many patients had primary care providers before diagnosis; this information is not in each chart, as patients are given the choice to release their genetic status to their primary care providers or withhold it. Public information and education will prove to be fundamental to the detection of individuals who have hereditary breast cancer syndrome. Sixty-five percent of the patients with BRCA mutations in our study population experienced breast cancer that might have been preventable, as they were eligible for genetic counseling, testing, surveillance and preventive care before their cancer diagnoses. As a result of this finding, we recommend that a number of measures be taken to ensure that at-risk individuals are afforded the opportunity to pursue effective screening and preventive options. Both patients and physicians would benefit from increased education and knowledge about genetic services. While increased physician education and a change in the way family history information is collected and used at the primary care level are important for various genetic services, they are not sufficient. Publicly available information is essential, so that women are able to assess their own potential for risk and choose to speak to their physicians about the issue. It is essential that women are empowered to make decisions about their own health, and they have a right to have ready access to the information necessary to do so. This research was funded by Genome Canada and the Ontario Genomics Institute (R1094A08). Ms Vanstone receives support from the Canadian Institutes of Health Research as a trainee in the Reproductive, Early Development and In-Utero Health program. We would also like to thank the staff of the Cancer Genetics Clinic of the London Regional Cancer Program. Breast cancer related to BRCA1 or BRCA2 gene mutation is an autosomal dominant inherited disease. These mutations confer a lifetime breast cancer risk of 45% to 87%. Women who have been made aware of familial high risk before cancer diagnosis can choose to access genetic counseling, testing, and preventive strategies. However, many identifiably high-risk women are not being referred for genetic counseling before being diagnosed with breast cancer. There are many structural constraints to providing genetic care in primary care, including lack of time; lack of clear clinical practice guidelines for referral to genetic counseling; difficulties in compiling, confirming, and regularly reviewing family cancer history information; and lack of up-to-date knowledge concerning genetic information and available genetic services. Women should have access to information that is publicly available to allow them to initiate a conversation about their personal genetic risks with their primary care providers. Le cancer du sein associé à une mutation des gènes BRCA1 ou BRCA2 est une maladie héréditaire transmise sur un mode autosomique dominant. Ces mutations entraînent un risque à vie de cancer du sein dans une proportion de 45 à 87 %. Les femmes qui ont été informées d’un risque familial élevé avant d’avoir un diagnostic de cancer peuvent décider de recourir à des consultations et des tests génétiques et à des stratégies préventives. Toutefois, plusieurs femmes qui pourraient être classées à haut risque ne sont pas dirigées vers des consultations génétiques avant qu’un diagnostic de cancer du sein soit posé. Il y a plusieurs obstacles structurels qui empêchent de fournir des soins génétiques en contexte de soins primaires, incluant les contraintes de temps; l’absence de directives cliniques claires concernant la prescription de consultations génétiques; les difficultés en rapport avec la compilation, la confirmation et la révision régulière des données sur l’histoire familiale de cancer; et le manque de mise à jour des connaissances au sujet de l’information génétique et des services de génétique disponibles. Les femmes devraient avoir accès à toute l’information qui est disponible au grand public afin d’être en mesure d’aborder avec leurs soignants de première ligne le sujet de leurs risques génétiques personnels.
. Genetic predisposition to breast cancer and genetic counseling and testing. In: Hunt KK, Robb GL, Strom EA, Ueno NT, editors. Breast cancer. 2nd ed. New York, NY: Springer; 2008. p. 57-81.
. Canadian cancer statistics, 2010. Toronto, ON: Canadian Cancer Society; 2010.
. Average risks of breast and ovarian cancer associated with BRCA1 or BRCA2 mutations detected in case series unselected for family history: a combined analysis of 22 studies. Am J Hum Genet 2003;72(5):1117-30. Epub 2003 Apr 3.
. Genetic heterogeneity and penetrance analysis of the BRCA1 and BRCA2 genes in breast cancer families. The Breast Cancer Consortium. Am J Hum Genet 1998;62(3):676-89.
. Population-based study of changing breast cancer risk in icelandic BRCA2 mutation carriers, 1920–2000. J Natl Cancer Inst 2006;98(2):116-22.
. Breast and ovarian cancer risks due to inherited mutations in BRCA1 and BRCA2. Science 2003;302(5645):643-6.
. Genetic risk assessment and BRCA mutation testing for breast and ovarian cancer susceptibility. Ann Intern Med 2005;143(5):355-61. Erratum in: Ann Intern Med 2005;143(7)547.
. Risk models for familial ovarian and breast cancer. Genet Epidemiol 2000;18(2):173-90.
. A comprehensive model for familial breast cancer incorporating BRCA1, BRCA2 and other genes. Br J Cancer 2002;86(1):76-83.
. Prevalence of BRCA1 and BRCA2 gene mutations in patients with early onset breast cancer. J Natl Cancer Inst 1999;91(11):943-9.
. The genetic attributable risk of breast and ovarian cancer. Cancer 1996;77(11):2318-24.
. Models of genetic susceptibility to breast cancer. Oncogene 2006;25(43):5898-905.
. Hereditary breast cancer: new genetic developments, new therapeutic avenues. Hum Genet 2008;124(1):31-42. Epub 2008 Jun 25.
. The genetic epidemiology of breast cancer genes. J Mammary Gland Biol Neoplasia 2004;9(3):221-36.
. Efficacy of MRI and mammography for breast-cancer screening in women with a familial or genetic predisposition. N Engl J Med 2004;351(5):427-37.
. Comparison of breast magnetic resonance imaging, mammography, and ultrasound for surveillance of women at high risk for hereditary breast cancer. J Clin Oncol 2001;19(15):3524-31.
. Breast cancer after prophylactic bilateral mastectomy in women with a BRCA1 or BRCA2 mutation. N Engl J Med 2001;345(3):159-64.
. Efficacy of bilateral prophylactic mastectomy in women with a family history of breast cancer. N Engl J Med 1999;340(2):77-84.
. Bilateral prophylactic mastectomy reduces breast cancer risk in BRCA1 and BRCA2 mutation carriers: the PROSE Study Group. J Clin Oncol 2004;22(6):1055-62.
. Salpingooophorectomy and the risk of ovarian, fallopian tube, and peritoneal cancers in women with a BRCA1 or BRCA2 mutation. JAMA 2006;296(2):185-92.
. Breast cancer risk following bilateral oophorectomy in BRCA1 and BRCA2 mutation carriers: an international case-control study. J Clin Oncol 2005;23(30):7491-6.
. First results from the International Breast Cancer Intervention Study (IBIS-I): a randomised prevention trial. Lancet 2002;360(9336):817-24.
. Tamoxifen and contralateral breast cancer in BRCA1 and BRCA2 carriers: an update. Int J Cancer 2006;118(9):2281-4.
. Tamoxifen and risk of contralateral breast cancer in BRCA1 and BRCA2 mutation carriers: a case-control study. Lancet 2000;356(9245):1876-81.
. Systematic review: using magnetic resonance imaging to screen women at high risk for breast cancer. Ann Intern Med 2008;148(9):671-9.
. Efficacy of bilateral prophylactic mastectomy in BRCA1 and BRCA2 gene mutation carriers. J Natl Cancer Inst 2001;93(21):1633-7.
. Ontario physicians’ guide to referral of patients with family history of cancer to a familial cancer genetics clinic or genetics clinic. Ont Med Rev 2001;68(10):24-30.
. Factors associated with age at natural menopause in a multiethnic sample of midlife women. Am J Epidemiol 2001;153(9):865-74.
. Presymptomatic DNA testing and prophylactic surgery in families with a BRCA1 or BRCA2 mutation. Lancet 2000;355(9220):2015-20.
. BRCA2 in American families with four or more cases of breast or ovarian cancer: recurrent and novel mutations, variable expression, penetrance, and the possibility of families whose cancer is not attributable to BRCA1 or BRCA2. Am J Hum Genet 1997;60(5):1031-40.
. Provincial predictive genetic testing service for hereditary breast, ovarian, and colon cancers. Toronto, ON: Ontario Ministry of Health; 2000. Report no. OHIP Bulletin 4352.
. Contending visions in the evolution of genetic medicine: the case of cancer genetic services in Ontario, Canada. Soc Sci Med 2008;67(1):152-60. Epub 2008 Apr 23.
, editors. Strengthening the quality of cancer services in Ontario. Ottawa, ON: CHA Press; 2003.
. Proband. Talking glossary of genetic terms. Bethesda, MD: National Human Genome Research Institute; Available from: www.genome.gov/glossary/index.cfm?id=164. Accessed 2012 Apr 5.
. BRCA mutation prevalence tables. Salt Lake City, UT: Myriad Genetic Laboratories Inc; 2010. Available from: www.myriad.com/lib/brac/brca-prevalence-tables.pdf. Accessed 2012 Apr 5.
. Ontario physician’s guide to referral for patients with a family history of cancer to a familial cancer genetics clinic or genetics clinic. Toronto, ON: Ontario Ministry of Health; 2002. Report no. OHIP Bulletin 4381.
. A survey of women receiving an uninformative BRCA1/2 result: reactions, risk perceptions, and disclosure to family members. In: Dickerson CD, Wicklund CAL, editors. Abstracts from the twenty-first annual education conference of the national society of genetic counselors (Phoenix, AZ, November 2002). New York, NY: Kluwer Academic/Plenum Publishers; 2002. p. 445-537.
. Sharing BRCA1/2 test results with first-degree relatives: factors predicting who women tell. J Clin Oncol 2006;24(4):700-6.
. Do women in the community recognize hereditary and sporadic breast cancer risk factors? Oncol Nurs Forum 2005;32(3):617-23.
. Misunderstandings concerning genetics among patients confronting genetic disease. J Genet Couns 2010;19(5):430-46. Epub 2010 May 29.
. A chip off the old block? Lay understandings of inheritance among men and women in mid-life. Public Underst Sci 2003;12(1):47-65.
. Theatre and research in the reproductive sciences. J Med Humanit 2010;31(1):81-90.
. Theatre as a public engagement tool for health-policy development. Health Policy 2006;78(2–3):258-71. Epub 2005 Dec 6.
. Genetic susceptibility to cancer. Family physicians’ experience. Can Fam Physician 2003;49:45-52.
. Canadian Community Health Survey: 2007 questionnaire. Ottawa, ON: Statistics Canada; 2007. Available from: http://statcan.gc.ca/imdb-bmdi/instrument/3226_Q1_V4-eng.pdf. Accessed 2012 Apr 5.
. The wait starts here. Mississauga, ON: College of Family Physicians of Canada, Canadian Medical Association; 2009.
. Family physicians and genetic medicine: roles and challenges. In: Knoppers BM, Scriver C, editors. Genomics, health, and society: emerging issues for public policy. Ottawa, ON: Policy Research Initiative; 2006. p. 67-79.
. Hereditary breast and ovarian cancers. Can Fam Physician 2008;54:1691-2.
. The ‘new genetics’ and primary care: GPs’ views on their role and their educational needs. Fam Pract 1999;16(4):420-5.
. Empowering primary care health professionals in medical genetics. How soon? How fast? How far? Am J Med Genet 2001;106(3):223-32.
. Does knowledge about the genetics of breast cancer differ between nongeneticist physicians who do or do not discuss or order BRCA testing? Genet Med 2003;5(2):99-105.
. A systematic review of the literature exploring the role of primary care in genetic services. Fam Pract 1999;16(4):426-45.
. Colorado family physicians’ knowledge of hereditary breast cancer and related practice. J Cancer Educ 2001;16(1):33-7.
. Swiss primary care physicians’ knowledge, attitudes and perception towards genetic testing for hereditary breast cancer. Fam Cancer 2003;2(3–4):153-8.
. 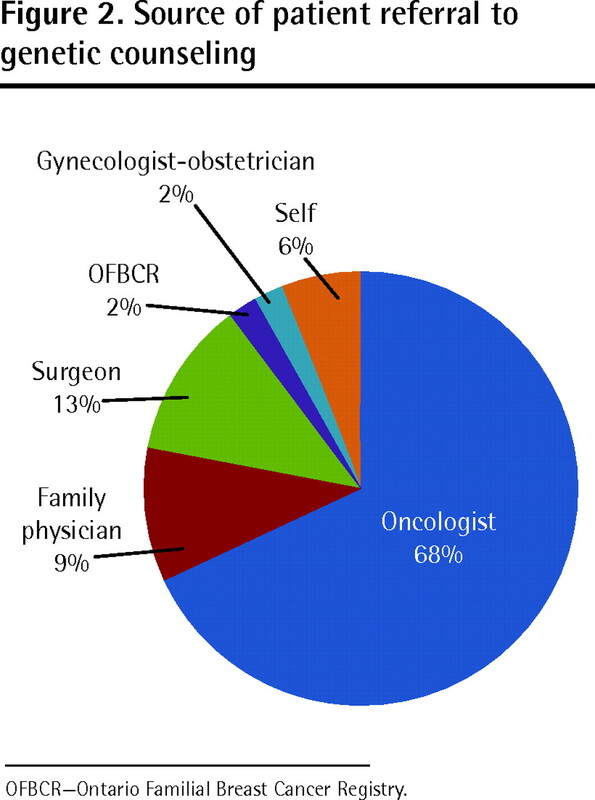 The primary care physician role in cancer genetics: a qualitative study of patient experience. Fam Pract 2010;27(5):563-9.
. Genetic services for hereditary breast/ovarian and colorectal cancers—physicians awareness, use and satisfaction. Community Genet 2008;11(1):43-51. Epub 2008 Jan 15.
. The need for public education: “surveillance and risk reduction strategies” for women at risk for carrying BRCA gene mutations. J Obstet Gynecol Can 2007;29(6):510-1.
. Genetic assessment of breast cancer risk in primary care practice. Am J Med Genet A 2009;149A(3):349-56.
. Identification and referral of families at high risk for cancer susceptibility. J Clin Oncol 2002;20(2):528-37.
. Collection and use of cancer family history in primary care. Rockville, MD: Agency for Healthcare Research and Quality; 2007. Evidence Report/Technology Assessment no. 159. AHRQ Publication.
. Reconsidering the family history in primary care. J Gen Intern Med 2004;19(3):273-80. Erratum in: J Gen Intern Med 2005;20(3):315.
. Personalizing prevention: the US Surgeon General’s Family History Initiative. Am Fam Physician 2005;71(1):36.
. Strategies to improve cancer screening in general practice: are guidelines the answer? Fam Pract 1999;16(1):66-70.
. Cancer genetic risk assessment and referral patterns in primary care. Gen Test Mol Biomarker 2009;13(6):735.
. The current state of cancer family history collection tools in primary care: a systematic review. Genet Med 2009;11(7):495-506.
. Primary care providers’ responses to patient-generated family history. J Genet Couns 2010;19(1):84-96. Epub 2009 Oct 24.
. Genetic education for primary care providers. Improving attitudes, knowledge, and confidence. Can Fam Physician. Vol. 55. 2009. p. e92-9. Available from: www.cfp.ca/content/55/12/e92.full.pdf+html. Accessed 2012 Apr 5.
. Hereditary breast cancer risk triage. Toronto, ON: Canadian Cancer Society; 2007.
. Genome-wide association study identifies novel breast cancer susceptibility loci. Nature 2007;447(7148):1087-93.
. Genome-wide association study provides evidence for a breast cancer risk locus at 6q22.33. Proc Nat Acad Sci USA 2008;105(11):4340-5. Epub 2008 Mar 7.
. Breast cancer risks in women with a family history of breast or ovarian cancer who have tested negative for a BRCA1 or BRCA2 mutation. Br J Cancer 2009;100(2):421. Epub 2008 Dec 16.
. Population BRCA1 and BRCA2 mutation frequencies and cancer penetrances: a kin-cohort study in Ontario, Canada. J Natl Cancer Inst 2006;98(23):1694-706.
. Epidemiology of ovarian cancer. Methods Mol Biol 2009;472:413-37.
. BRCA1 and BRCA2 mutations account for a large proportion of ovarian carcinoma cases. Cancer 2005;104(12):2807-16.
. How do women decide? Accepting or declining BRCA1/2 testing in a nationwide clinical sample in the United States. Community Genet 2006;9(2):78-86.
. Uptake rates for breast cancer genetic testing: a systematic review. Cancer Epidemiol Biomarkers Prev 2006;15(5):840-55.
. Clinical characteristics of individuals with germline mutations in BRCA1 and BRCA2: analysis of 10,000 individuals. J Clin Oncol 2002;20(6):1480-90.
. Numerous high-risk epithelial lesions in familial breast cancer. Eur J Cancer 2006;42(15):2492-8.
. CHEK2*1100delC genotyping for clinical assessment of breast cancer risk: meta-analyses of 26,000 patient cases and 27,000 controls. J Clin Oncol 2008;26(4):542-8.
. International variation in rates of uptake of preventive options in BRCA1 and BRCA2 mutation carriers. Int J Cancer 2008;122(9):2017-22.
. Psychosocial genetic counseling. New York, NY: Oxford University Press; 2000.
. Counseling about cancer: strategies for genetic counseling. 2nd ed. New York, NY: Wiley-Liss; 2002.
. Genetic testing for cancer: psychological approaches for helping patients and families. 1st ed. Washington, DC: American Psychological Association; 2005.